1. In a medium saucepan, stir brown sugar, butter and corn syrup over medium-low heat until combined. Remove the saucepan from the heat. Stir in the 1/4 cup peanut butter and the vanilla until smooth. 2. Place rolled oats in a very large bowl. Pour brown sugar mixture over oats, stirring gently until combined. Press oat mixture evenly onto bottom of ungreased 13x9x2-inch baking pan. 3. Bake mixture in a 375° oven for 10 to 12 minutes or until edges are lightly browned. Let oat layer cool slightly in the pan on a wire rack. 4. In the same saucepan, stir chocolate pieces and butterscotch pieces together over low heat until melted. Stir in remaining 2/3 cup peanut butter until chocolate mixture is smooth. 5. Sprinkle half of the peanuts over oat layer in pan. 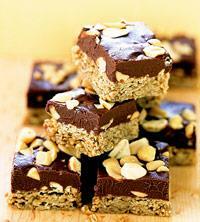 Slowly pour chocolate mixture over the peanut-topped oat layer, spreading evenly. Sprinkle rest of peanuts on top of chocolate. 6. Cool cookies in the pan on a wire rack for several hours or until chocolate layer is firm. Cut into 1-inch squares. Makes about 115 pieces. Tip: To speed the setting of the chocolate layer, slightly cool cookies in the pan at room temperature. Then, place pan in refrigerator or freezer for several minutes until cookies are firm. Select a size and use your browser's print button to print the page. 1. Preheat oven to 350 degrees F. Line a 13x9x2-inch baking pan with foil, extending foil over the pan edges. Set aside. In a large bowl, stir together oats, flour, brown sugar, and baking soda; set aside. In a small saucepan, stir together the butter and 1/3 cup peanut butter. Heat over low heat until melted and smooth. Add the melted peanut butter mixture to the dry mixture. Stir until well combined. Press mixture evenly into bottom of prepared pan. Bake in the preheated oven for 15 minutes or until golden brown. Place pan on a wire rack. 2. In a large saucepan, combine dark chocolate and 2/3 cup peanut butter. Heat over low heat until melted and smooth, stirring occasionally. Spread chocolate mixture evenly over warm crust. Sprinkle toffee pieces evenly over the chocolate mixture. Cool in the pan on a wire rack for 2 hours or until chocolate sets. Using the edges of the foil, lift the uncut bars out of the pan. Cut into bars. Makes 24 bars. 1. Cook couscous according to package directions, omitting oil and salt; keep warm. 2. In a large nonstick skillet, heat oil over medium-high heat. Add chicken, shallots and garlic to pan. Cook 2 minutes, stirring. 3. In a bowl, combine salt and all spices; sprinkle evenly over chicken. Cook, stirring, 2 minutes more, or until chicken is cooked. 4. Cut any large pieces of squash in half; add to skillet along with carrots, broth, and raisins. Bring to a boil; cover. Simmer 6 to 8 minutes, or until vegetables are crisp-tender. 5. Serve stew over couscous. Garnish with fresh mint, if desired. 1. In small bowl combine graham crackers, margarine, and sugar. Press crumb mixture in the bottom of a 2-quart square baking dish. Refrigerate while preparing filling. 2. In large bowl combine gelatin and water. Stir until gelatin is dissolved. Set aside. 3. In blender or food processor combine cottage cheese and cream cheese. Cover and blend or process until smooth, stopping several times to scrape down sides. Whisk 1/2 cup of the cottage cheese mixture into the gelatin mixture. Whisk in remaining cottage cheese mixture until smooth. Fold in whipped dessert topping. Spoon filling over chilled crumb mixture. 4. Cover and refrigerate 8 to 24 hours or until filling is firm. To serve, cut in squares. Top with lime wedges. Makes 9 servings. spinach are packed with essential nutrients like vitamins A and C and potassium. 1. Put spinach in an 8-inch square microwavable dish and cook on high for 4 minutes or until wilted. 2. Drain any liquid, remove spinach to a bowl, and mix with ricotta, half of mozzarella, half of Parmesan, egg white, 4 teaspoons of parsley, salt, and pepper. 3. Wipe out baking dish and generously coat with cooking spray. Mix in onions, pepper, zucchini, and garlic. Mix until coated with spray, then cover tightly with microwave-safe plastic wrap and cook on high for 5 minutes or until vegetables are soft, stirring once. 4. Uncover and scrape vegetables onto a plate. 5. Spread a layer of tomato sauce over bottom of same dish. Add a layer of 2 noodles. Spread a third of cheese mixture over noodles, covering noodles completely. Spoon a third of vegetable mixture over cheese, then spoon on a quarter of sauce, making sure noodles are covered. 6. Repeat layers of noodles, cheese, vegetables, and sauce to make a total of 4 layers of noodles. Top final layer with remaining sauce. 7. Cover tightly with microwave-safe plastic wrap and cook on high for 10 minutes or until noodles are almost tender. 8. Scatter remaining mozzarella and Parmesan over top and cook uncovered on high for 5 minutes or until cheese is melted. Sprinkle with remaining 2 teaspoons parsley. Let sit 5 minutes before cutting. "This kid-friendly vegetable recipe was tested by families on BUSH'S® Beans Moms and Kids Panel." 1. Heat olive oil over medium heat in a medium sauté pan. Add sausage; brown well. 2. Add tomato paste, cook 5 minutes until brown. 3. Add onions, celery, garlic, carrots and oregano. Cook until garlic is aromatic, approximately 5 minutes. 4. Pour into a 4-quart slow cooker. Add tomatoes and chicken stock. 5. Cook on low setting for 6 to 7 hours or until the vegetables are tender. 6. Stir in beans, zucchini, spinach and cooked pasta. Cook on high setting for 8 minutes or until beans and pasta are warmed through and spinach has wilted. 7. To Serve: Pour the soup into a bowl. Top with a little pesto and fresh grated parmesan cheese. The original recipe for these cookies is a top rated recipe on the Food Network website and it was contributed by Wendy Gaynor, the owner of the Ruby et Violette cookie bakery in New York City. The original recipe calls for a stick of butter; I switched to a less fat margarine with a low amount of saturated fat and no trans fat. I decreased the sugar by 1/3 and used a majority of whole-wheat flour to make the dough, which adds nutrients and fiber. 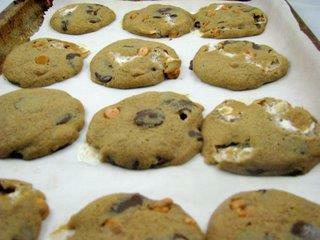 The original cookie recipe calls for 3 types of chips (peanut butter chips, toffee chips and semisweet chocolate chips). I kept the two types of chocolate and took out the toffee chips. And fiber increases by about 1 gram per serving! In large mixing bowl, combine margarine with dark brown sugar until thoroughly blended, scarping sides and bottom of bowl frequently. Add in the egg and vanilla extract and beat on low speed, scraping sides and bottom of bowl, until blended. In separate bowl, combine flours, salt and baking soda. Add flour mixture to margarine/sugar mixture while beating on low speed until combined. Stir in both types of chocolate chips and marshmallows with a scraper or spoon. Cover bowl and refrigerate until cold (at least two hours). Preheat oven to 350-degrees. Line baking sheet with parchment paper and use a cookie scoop to drop balls of dough (about 2 tablespoons each), 2 inches apart, on prepared baking sheet. Bake for about 10 minutes (bake longer if you like your cookies crisp and not chewy). Let them rest on the cookie sheet for a few minutes then remove cookies to a wire rack and let them cool. Per serving: 168 calories, 2 g protein, 23 g carbohydrate, 7.5 g fat, 4 g saturated fat, 11 mg cholesterol, 1.2 g fiber, 112 mg sodium. Calories from fat: 40 percent. "Kids love to make (and eat) these sugar free cookies." 1. Combine peanut butter, milk powder, and coconut in a large mixing bowl. Stir in oats, ground cinnamon, wheat germ, and apple juice concentrate until thoroughly combined. 2. Shape the mixture into 1 inch balls. Chill thoroughly before serving; store remaining nuggets in the refrigerator. These baked beauties are a breakfast food lover and cardiologist pleaser-the pectin fiber in apples, the oat bran, and the vitamin E-rich canola oil are loved by docs because together they lower cholesterol- both total and LDL and keep insulin and blood sugar levels under control. But protecting yourself against heart disease won't even cross your mind when this dessert-worthy combo of apples, cinnamon, and nutmeg hits your taste buds. Too yummy to be typecast as breakfast treat, these low-fat muffins can be popped anytime for a filling and satisfying bite. 2. In a large bowl, whisk together bran, flour, flaxseed, baking soda, baking powder, cinnamon, and nutmeg. 3. In a separate bowl, whisk together egg and oil until smooth. Stir in applesauce, shredded apple, and sugar. Combine mixtures and fold in pecans. 4. Spoon batter into paper-lined muffin cups. Bake for 22 to 25 minutes or until tops spring back when lightly touched. Cool the apple muffins a wire rack. Eight to 24 hours before you want to make your pancakes, mix the rolled outs and one of the milk options together in a glass jar, cover it loosely, and set it on the counter to soak. When you are ready to make your pancakes, preheat a skillet over medium heat (I like a good heavy cast-iron skillet). Then, add the rest of the ingredients to your soaked oats and mix well. The oatmeal should have absorbed all the milk, so there's no need to drain it. This pancake batter will be thicker and have more texture than an average batter. Melt a little butter in your pan, scoop in some batter, and cook until the little bubbles break the top surface and the top surface looks dry (adjust the heat so the bottom gets golden brown). Then flip the pancake and cook until that side is golden brown (about half the time the first side took). Serve with more butter and real maple syrup, sorghum syrup, honey, or fruit preserves. Yum! 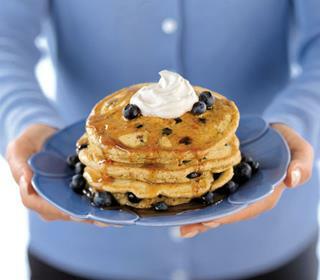 Homeade pancakes are easy to make—even if you don't use wheat. 1. Preheat oven to 375 degrees F. Grease bottoms and sides of two 8x1-1/2-inch round cake pans. Line bottoms with waxed paper; lightly flour pans. In bowl combine flour, pumpkin pie spice, baking powder, and salt; set aside. 2. In a second bowl beat eggs and sugar with an electric mixer on medium to high speed until thick, about 5 minutes. Beat in pumpkin. Add flour mixture; beat just until combined. Spread cake batter in prepared pans. Bake 16 to 18 minutes or until wooden pick inserted near centers come out clean. Cool in pans on wire rack 10 minutes; remove and cool thoroughly. 3. For filling, in a chilled mixing bowl beat whipping cream to soft peaks; set aside. In a second mixing bowl beat cream cheese until smooth; beat in powdered sugar. Fold in whipped cream. To assemble, place one cake layer on serving platter. Spread cream cheese mixture evenly over bottom cake layer. Top with second cake layer. Refrigerate while preparing Chocolate Cream Icing. 4. If Chocolate Cream icing is too thin, cover and chill 30 minutes until of spreading consistency. Too thick, add a teaspoon of milk or cream. Spread over top and sides of cake. Sprinkle lightly with pumpkin pie spice. Chill cake at least 1 hour before serving. 5. Store cake, loosely covered, in refrigerator. Makes 8 servings. 6. Chocolate Cream Icing: In small saucepan bring 1/2 cup whipping cream just to boiling over medium-high heat. Remove from heat. Pour over 1 cup bittersweet or semisweet chocolate pieces in medium bowl (do not stir). Let stand 5 minutes. Stir until smooth. Cool 15 minutes. Makes 1-1/4 cups. A good wrap is great to go! Here's a delicious recipe for leftover chicken that will taste as good—or better—than any wrap you can buy at the deli. Saran™ Premium Wrap, pack it with a chewy brownie and a healthy bean dip, and take it off to school or work. STEP 1. Place the peanut butter, lite soy sauce, and water in a bowl. Whisk together until evenly combined. Set aside. STEP 2. Slice the cooked chicken breast into chunky slices and place half the amount of chicken on each tortilla. STEP 3. Divide the carrots and lettuce equally and place on top of the chicken in each tortilla. "This is great for turkey leftovers. Simple, quick and flavorful. This is a good one for substitutions too. I've used white wine in place of lemon, sour cream in place of yogurt, chicken in place of turkey and Indian naan in place of the pita. Enjoy!" 1. Heat oil in a skillet over medium-high heat. Stir in onion and lemon juice. Cook until onion is tender. Mix in turkey, season with curry powder and continue cooking until heated through. 2. Remove from heat. Stir in apple. Stuff pitas with the mixture. Drizzle with yogurt to serve.